At the recent ICC Awards 2018, Bumrah was included in the ICC Men's ODI team of the Year and also in the ICC Men's Test team of the Year. Indian pacer Jasprit Bumrah is going through a purple patch in his career. In such a short span of time, Bumrah has emerged as one of the top bowlers in world cricket. His excellent run of form in white ball cricket translated exceedingly well in the red ball cricket as well. He made his Test debut last year and proved to be one of the better bowlers on the South African tour. A similar story followed in England, and more recently, his exploits were there to be seen for everyone in the Test series against Australia. With such sublime run of form, it was only obvious that Jasprit Bumrah would get rewarded for his excellent performances. At the recent ICC Awards 2018, Bumrah was included in the ICC Men’s ODI team of the Year and also in the ICC Men’s Test team of the Year. The Indians have thoroughly dominated the ICC Awards 2018, with Virat Kohli sweeping the magical triple of top honors, and Smriti Mandhana fetching a top honor in Women’s cricket. Soon after the announcement was made, the Mumbai Indians were quick to congratulate their star bowler. Jasprit Bumrah has been a part of the franchise for quite some time now, and is an integral part of the setup. Ever since he has been picked up by the franchise, after a talent scout led by the then coach of the team, John Wright, Bumrah’s services have been retained by the team. Needless to concede, they value their champion bowler. 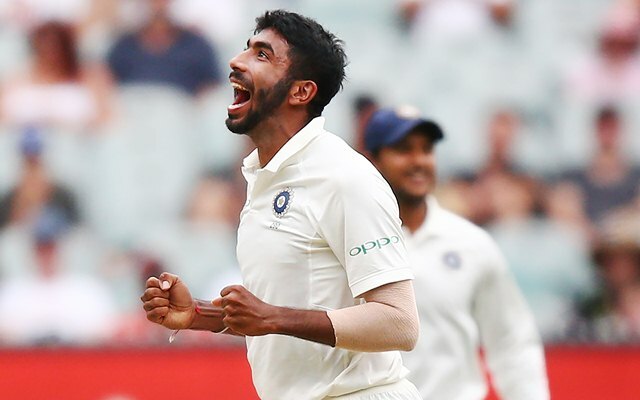 The franchise drew a unique in-trend comparison to congratulate Bumrah on his recent achievement. They named him the ‘Gully Boy’, which translates to a street grown boy. This is in reference to the fact that Bumrah played his early cricket on the streets with tennis ball. “If you see, whether it is me coming from Pakistan or Bumrah coming from India, we are all products of tennis ball cricket,” Wasim Akram had recently commented accrediting the success of Bumrah to tennis ball cricket. The franchise also tagged actor Ranveer Singh in their tweet, as Ranveer will be starring in the upcoming Bollywood flick ‘Gully Boy’. They have cheekily taken the popular slogan from the movie ‘Apna time aayega’ (Our time will come), and modified it to Bumrah’s liking as ‘Apna time aagaya’ (Our time has come), in the tweet. “From a talented #GullyBoy cricketer to 2018 @ICC Men’s ODI Team and Test Team of the Year. Apna Time Aagaya, @Jaspritbumrah93 #CricketMeriJaan @RanveerOfficial,” Mumbai Indians posted in their recent tweet.